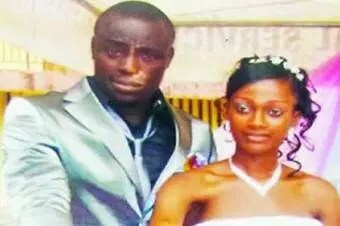 BUSINESSMAN, WHO VIDEOED DYING WIFE, ARRESTED - Onome Talk Am! A 29-year-old businessman, Oluchi Ajimowu, is being held by the State Department for Criminal Investigation, Yaba, Lagos, for his alleged involvement in the death of his wife, Priscillia Ajimowu. Priscillia and Oluchi lived with their children in the FESTAC area of the state. The police are working on two theories; that Oluchi smashed the wife’s head on the floor, or the 23-year-old mother of two poisoned herself after being frustrated by her husband. PUNCH Metro learnt that Oluchi had locked the deceased in her room on November 29, seized her phone and went out with their two children. It was gathered that Oluchi on arrival met his wife foaming in the mouth. Our correspondent learnt that Priscilla, a nurse, demanded to be taken to a hospital, but her husband allegedly declined, and gave her palm oil instead. He reportedly videoed her for about 40 minutes after which she gave up the ghost. It was gathered that prior to the incident, Oluchi had subjected the deceased to inhuman treatment for the four years they spent in South Africa. Oluchi came back to Nigeria four months ago while the wife arrived on November 27, two days before her death. It was learnt that Oluchi wrote “for sale” on the house shortly after the wife’s death. The couple’s first child, seven-year-old Ella, told our correspondent that there was a pesticide and a drink in the room where her mother was on the fateful day, adding that her father was “not nice to my mother” while they were in South Africa. She said, “Dad used to shout at mummy and beat her and she would be crying. That day (November 29), we left her alone in the house. Daddy took the keys and mummy’s phone and locked mummy inside. The deceased’s mother, Mrs. Stella Ayobo, said her daughter had planned to visit her on the fateful day, but later cancelled the visit. The mother said Priscillia had not been happy since she got married to Oluchi seven years ago. She added that Oluchi had shortly after his wife’s death reported at the Aguda Police Division, saying a friend took poison and died in his house. She said, “Four years ago, they went to South Africa. She always called me to report how Oluchi maltreated her. “She came back to Nigeria on November 27. She visited me on November 28 and promised to visit me again the following day, being a Sunday. But that day, around 8am, she called me that she would not be able to come again and promised to come with her children on Friday. “Around 8pm that Sunday, her husband called me that she had been vomiting since morning and I told him to take her to a nearest hospital. He later called me and said it was a poison she took. I told him to bring her. By the time she brought her, she was dead. We took her to a hospital and the doctor said she had died. The mother urged the police to investigate the matter to a logical conclusion and give justice to the family. Priscillia’s elder sister, Mrs. Emenike Dorcas, said Oluchi had convinced her sister to come to Nigeria under the pretext that he would open a chemist’s for her. The deceased’s uncle, Francis Ayobo, said the suspect was not remorseful after her wife’s death. He said, “It is so surprising that the wife was dying and the husband started videoing her. The videos were more than 40 minutes. He sent it to Priscillia’s sister in South Africa. By that time he would have rushed her to a hospital for treatment. The Lagos State Police spokesperson, DSP Joe Offor, said the Aguda Police Station arrested the husband and handed him over to the Satellite Town Police Division. He added that he would get back to our correspondent with more detail. Hmmnn. …..This institution called marriage, may God help the women folk.How can a husband choose to video his dying wife instead of taking her to the hospital? In the presence of their children,Omg. ……He just created an unforgettable painful memory in the subconscious of those children. Wht did I just read!!! Wow!!! Is this wht the marriage thingy is all about?? This generation has totally lost it.. What we have now isn’t marriage, its just 2 strangers pretending to be married, but taking out their frustrations on each other. Its like having a regular person to take frustrations on.